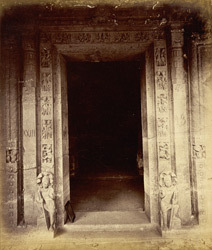 Photograph of the doorway with flanking sculptures of the Buddhist Vihara, Cave XXIII at Ajanta, taken by Robert Gill in c.1868-70, from the Archaeological Survey of India Collections. The Buddhist cave temples of Ajanta were excavated in a crescent-shaped cliff overlooking the Waghora River in the 2nd and 1st centuries BC. Cave 23 is a partly incomplete monastery which dates to a later period of excavation, in the late 5th century. The porch doorway is carved with floral coil mouldings with amorous couples carved on the jambs and two Naga sculptures flanking the entrance.